Starbucks is rolling out its new Costa Rica Finca Palmilera coffee that costs $7 a cup (or $40/lb). So what better way to find out if people can tell the difference than by having a taste test? That’s what Jimmy Kimmel did on his show last night. 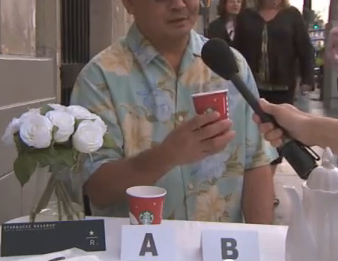 Except his test wasn’t to see if people could pick out the more expensive coffee — it was to see if people could tell that they were actually just sipping from two cups of the same exact, regular old Starbucks coffee. “This one has a richer taste… more premium,” on test subject responded. During tours of the Consumer Reports offices, the folks in the sensory lab like to pull this sort of test on unsuspecting people by having them sample Jell-O of different colors but all the same flavor. Inevitably, the color of the food tricks many subjects into believing there are differences in the taste.